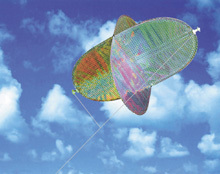 This 1600mm wingspan kite is made of high-quality ripstop nylon fabric and fibreglass spars. It will fly in winds from 4 knots up to 20 knots and protects up to 25 acres. This 1600mm wingspan kite is made of high-quality ripstop nylon fabric and fibreglass spars. When flown it is best tethered in a field to a stake or large stone and flown on 80 metres of line. When flying high this kite will provide protection for up to 25 acres, depending on the lie of the land. Properly assembled and trimmed this kite will fly in winds from 4 knots up to 20 knots, above this speed it is wise to land your kite especially if the wind is gusting. Farmers have reported these kites staying up 3 or 4 days at a time. Sometimes in severe weather, with down draughts and heavy gusts, or in still air between changes in wind direction, the kite will be forced to the ground.